It's apple pickin' time! The orchards and markets are full of great apples to bake with and eat. 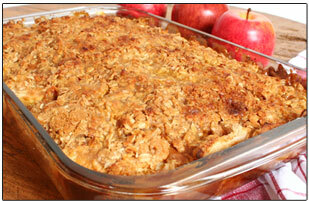 Get started with some wonderfal Fall baking recipes from www.recipetips.com. Gather the kids around and enjoy some time together making caramel apples. They are the perfect fall snack and are so easy to make. Have a variety of sprinkles, coconut, chopped mixed nuts and mini chocolate chips on hand and let the kids have fun creating their own unique apples. Select a firm, ripe and semi-tart apple to compliment the sweetness in the caramel. Nothing tops toast, ice cream, pancakes and waffles like homemade apple butter. The cinnamon and apple flavor combination will have everyone wanting this recipe. The best part is how easy it is to make and it is great to give as gifts for the Holidays. A quick acidic bath works wonders to keep fresh fruit from turning brown. A quick method for making this classic dessert recipe. With minimal ingredients and preparation time, this irresistable apple crisp recipe is so easy to make that even the novice cook can feel confident in the outcome. Enjoy!